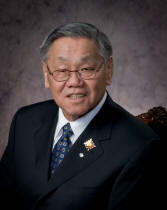 The Heritage Community Foundation is proud to announce that on 25 February 2005 the Honourable Norman L. Kwong, Lieutenant Governor of Alberta, advised that he would be delighted to serve as Chief Honorary Patron. The Foundation is delighted to have a passionate Albertan and Canadian as the principal ambassador for heritage. "This centennial year, people across Alberta will celebrate the amazing province we call home. And from this firm foundation, we will look ahead to the prospect of building something even greater. . .the next Alberta."